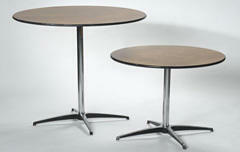 This round bistro or cocktail style table can be used as a high table (42 inch height) or at the standard 30 inch height. Your guests can set down their drinks or snacks as they chat. Table top: 30 inch diameter. Table height can be 30 or 42 inches. Please specify desired height when ordering.